We Can See Easily With Telescope, The Wormholes Cast Shadows: The hypothetical cosmic portals linking two points of space-time that we call wormholes are the stuff of science fiction and space theory right now – but if they really do exist, one scientist has come up with a way we might spot them: by the shadows they leave. It’s similar to the way that we spot black holes, not by looking at the objects themselves, but rather at the ripples and the effect they have across the rest of space. That sounds straightforward enough and it’s something that’s been proposed before, but one challenge of this approach is figuring out how the shadows from black holes and wormholes would differ. And, of course, knowing what to look for. Now a new paper has laid out a hypothetical way wormhole signatures might be detected and distinguished from those of black holes – kind of like an X on a cosmic treasure map. It’s just possible that one day this mathematical map model might help us to confirm whether there are actually wormholes out there in the Universe. “The results obtained here indicate that, through the observations of their shadows, the wormholes which are considered in this work and have reasonable spin, can be distinguished from a black hole,” says physicist Rajibul Shaikh, from the the Tata Institute of Fundamental Research in India. Wormholes are most often mentioned in sci-fi movies as ways of jumping great distances through space or across time, as if by magic. 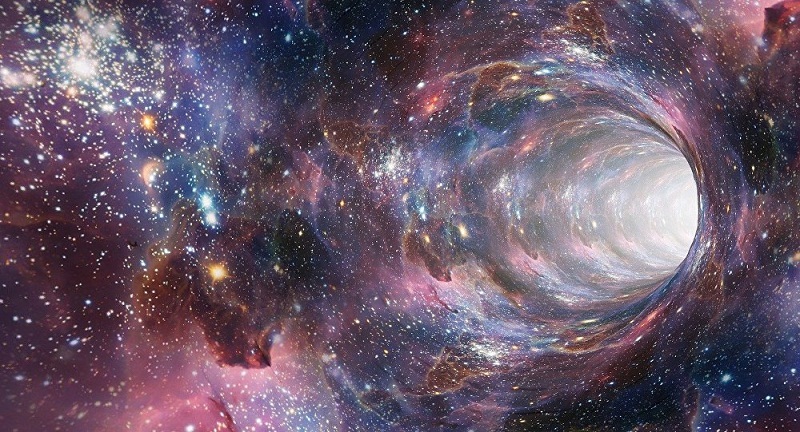 The way it works in theory is almost as if space folds over on itself to connect two points in four dimensions that were previously very remote from each other – though wormholes can also cover very short distances or time periods. And while that all sounds fantastically improbable, scientists are determined to keep investigating: wormholes have been theorized about for nearly 100 years, and they’re consistent with Einstein’s theory of general relativity. In more technical terms, they’re parts of space where light no longer travels in a straight line. Light particles bend around a wormhole, astrophysicists think, and particles that get too close fall into the void – creating a shadow. That’s where the new research comes in. It’s worth reiterating that this study only focuses on one type of wormhole, a Teo class rotating wormhole, and while Sheikh has submitted his paper to the Physical Review D journal, it hasn’t yet been peer-reviewed. It’s currently published online in pre-print journal arXiv. At the same time, it’s such an intriguing concept that any new research on wormhole formation is going to pique our interest. Even the models that end up missing the mark could help us one day work out whether or not wormholes actually exist. And that might not be so far off – scientists are hard at work on a new Event Horizon Telescope (EHT) that just might help us take a good long look at black holes directly. If it can see black holes, it could theoretically see wormholes too. The EHT is actually a network of telescopes that could provide the magnification required to see a black hole, not just its effects on space. The first batch of data from it is now being analyzed, and this research could help us make sense of it.